What is this project's time-frame and which museum will be the painting's permanent home? The conservation of Nelli's Crucifixion began in late 2016 and the painting will be completed and exhibited in April 2018. Its inaugural unveiling is scheduled for the week of October 13, 2018, during AWA's Autumn Sojourn. Once a sixteenth-century monastery, the Last Supper Museum of Andrea del Sarto in Florence has become a center for Nelli's restored works in recent years. The painting will be exhibited permanently, as the central work of a three-piece commission by sixteenth-century prioress Arcangela Viola. AWA restored her two other lunettes depicting Saint Dominic and Saint Catherine in 2009. The museum (also known as San Salvi) will host our inaugural event and international press conference. 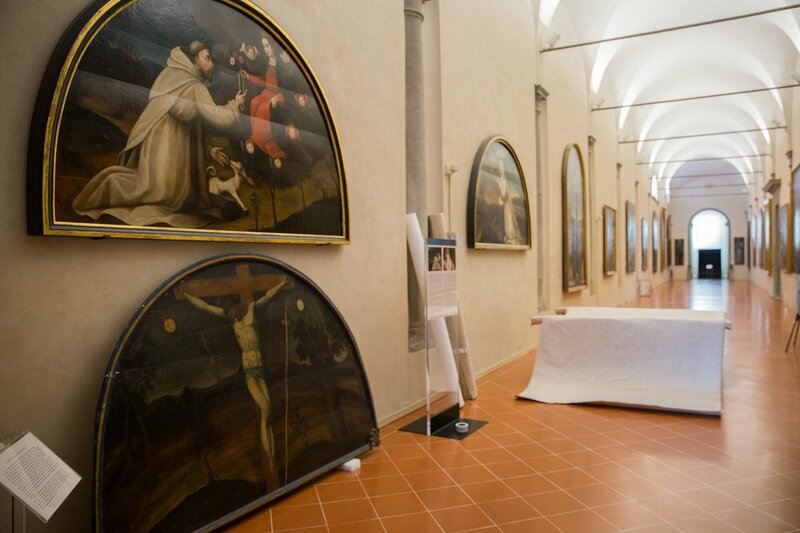 AWA's initial project partners Tuscany's Regional Museum Circuit, the Last Supper Museum of Andrea del Sarto and Rossella Lari Restoration Studio. Nancy Galliher – $5,000 gift towards the restoration of Nelli's Crucifixion. To learn about the top-level sponsors who are generously supporting this project: clic here.